Sorry for the lame picture - it's gets dark early now! Imagine the horror when I realized I hadn't made this casserole in over a year? I know, tragic. 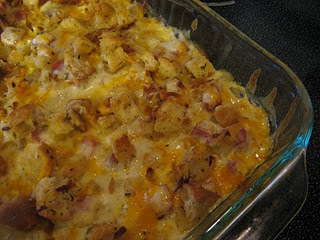 I brought it back this week, thanks to an evening of flipping through my recipes and seeing my neglected 'chicken cordon bleu casserole' sitting in the back with a big 'ol frown. I'm sorry buddy, but summer has been crazy and casseroles don't usually jump out at me during the months of June through August, when the oven isn't exactly my best friend. I think he forgave me. 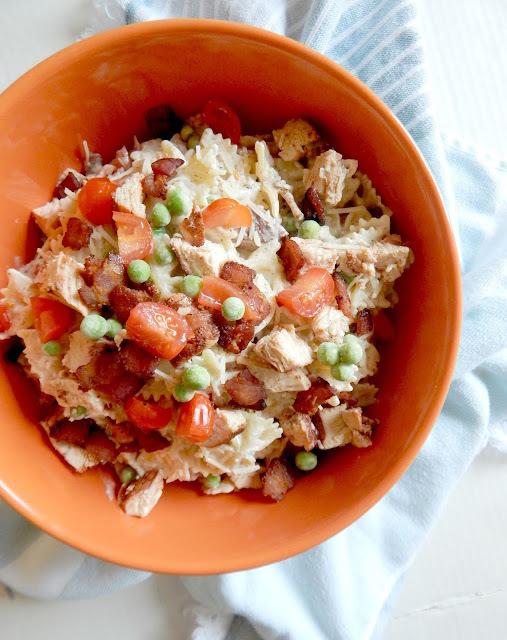 If you love chicken, ham, swiss cheese and crunchy goodness, you'll love this one. It is a tried and true recipe from a dear friend's mom - we go way back - and I just wouldn't be sharing it with you if it wasn't delicious. So here you have it folks, the ultimate comfort casserole. And remember, calories don't count on this one. In a pan saute onion in butter until tender. Add flour, stir to form a paste, about a minute. Gradually add cream, stirring constantly. Bring to a boil for 1 minute, until thickened. (I took mine off the heat after that minute and it thickened pretty quickly). Add seasonings once thick. Layer chicken, ham and 1 c. shredded cheddar in bottom of a 9x13 pan. Pour cream mixture over the meat. Add toppings and drizzle with butter. Bake at 350 degrees for 30 minutes. Put this on your grocery list for the weekend. Your family will LOVE it. That casserole looks great. I love casseroles because they are easy, and I have never had one that I didn't like.